K-Tuned Fuel Rail Fittings - Dezod Motorsports Inc - Home of the automotive performance enthusiast since 2002. Here is another optional fitting that can be used with our K-Tuned Fuel Rail. Available in 6AN or 8AN, the center port fitting can be used as either a feed or return depending on the fuel demands of the engine being used. Show and all motor cars with up to 300 whp will like the clean look this fitting gives because the fuel feed line can be hidden or “tucked” for super clean looking engine bay. Turbo setups have used this third port for a return line to the FPR when both ends of the rail are used in a duel feed system. Anodized black finish with 2 O-rings included. 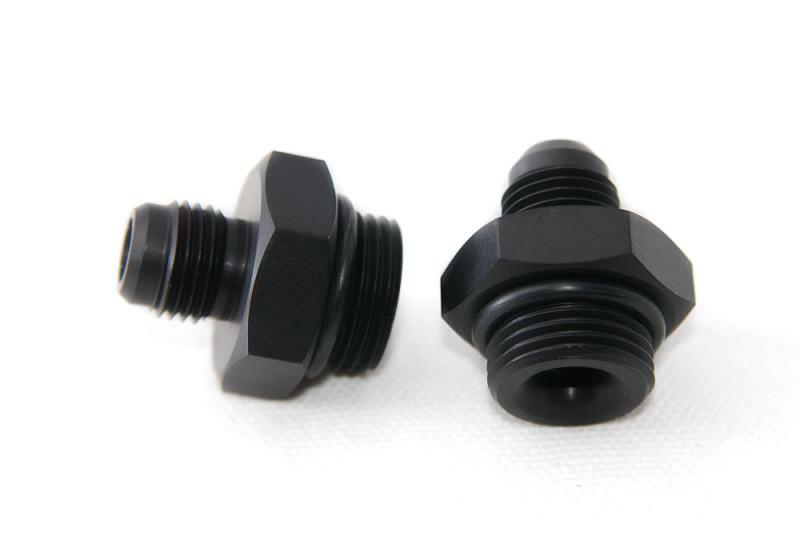 These 8AN to 6AN adapter fittings feature a full-flow tapered shape on the port side of the fitting to improve fuel flow. Inlet fitting size 8AN. Outlet fitting size 6AN male. These adapters can be used on most fuel rails with 8AN o-ring inlet ports. These RSX specific fuel fittings are designed to work with our K-Tuned fuel rail and the existing OEM RSX fuel lines. They will also fit any rail with 8AN inlet / outlet ports. This kit includes 2 fittings: a full flow 5/16” EFI fitting and 8AN port plug. Price is for both fittings.